Do you feel like everyone you meet are like “deja vu”? Hearing the same questions over and over again making you just want to give up? That’s because people aren’t trying anymore, wooing doesn’t seem a “thing” anymore. This week’s guest post discusses what works and what doesn’t and the boring questions that stop you getting dates. In her adorable Australian accent, she had been kidding about what their kids would be called, but soon enough the conversation was sleepwalking down the same of dreary road of monotony. Michael must be one of millions making the same mistakes when meeting potential partners both online and offline. 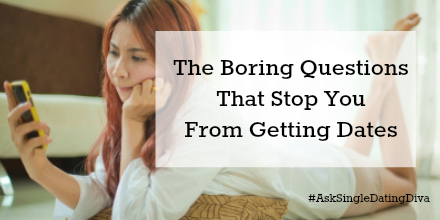 It’s not necessarily that these questions are boring. People love talking about themselves. If you asked anyone these questions, they’d probably think you were extremely pleasant. But then they’d probably forget you. For someone you’ve just met to remember you, they have to experience you, but these questions aren’t showing off your personality at all. You’re simply giving them the same experience as the last six or seven people who asked them about themselves. You’re not spiking their emotions. You’re not sharing anything interesting. What reason would they have to separate you from everyone else who spoke to them that evening? Yes, it’s nice (even essential) to get to know someone better before asking them out, but there’s a better method of doing it. It’s easy to take what you want to find out and transform it into an assumption. This is infinitely more interesting. Everyone wants to know how they are perceived by others and why they are perceived that way. Even if you’ve just met, this trick will almost always provoke others to ask why you made such an assumption. Suddenly, they’re already engaged enough to ask YOU questions. These interactions are more memorable because they’ve probably never had such an assumption made about them before. Also, these guessing games are more goofy and playful than the serious ‘getting to know you’ route that most guys and girls use. You’ll probably both be giggling within a minute of meeting. It’s a powerful process because it forces you to come up with spontaneous, honest observations and compliments. When a compliment comes from the heart, it strikes you so much harder. The recipient realises you’re actually attracted to them, and they’re not just the next one you’ve tried it on with. Assumption is also a powerful alternative to asking for permission. “Give me your phone number and I’ll call you this weekend” is a bit cocky but also demonstrates assuredness and confidence. The correct amount of cockiness can make men and women even more attracted. Crack out this ‘assumptive close’ once it’s clear there’s a connection and it’ll be tough for them not to comply. Follow this advice and you can assume you’ll have a fair share of dates lined up for the future. READERS: What are your thoughts? Are you tired of all the boring deja vu questions? What do you think of these ideas? Share your thoughts in the comments below! Joe Elvin is a magazine journalist finding his feet in London. He blogs about love, dating and relationships at www.thelondondater.co.uk. Follow him on Twitter & Facebook. Next Why Freedom Really Is A Lonely Road, Or Is It? Thanks I love this advice! If I have a hard time coming up with something to say to a woman as an online introduction thats a sign I’m not that into her and I re-assess my attraction. I also like Joe’s advice because i too often ask the same question, but do it because I don’t care what the answer is, I’m just feeling her out to see if she’ll make an effort to learn about me. I’ll definitely remember this when I’m out meeting people in person.